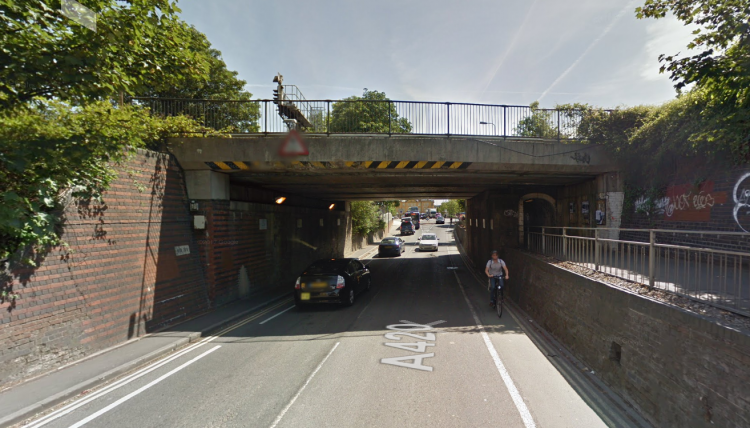 The A420 Botley Road in Oxford in one of the main roads through Oxford and passes underneath a railway bridge near the railway station. The road is on a downhill gradient with a sag curve underneath the railway bridge, however the clearance beneath the bridge is limited, meaning that the local bus company has to run a fleet of specially lowered buses to enable them to pass under the bridge. We were asked to create a new, lowered vertical alignment which would allow the bus company to run normal double decker buses underneath the bridge with sufficient clearance. We also had to demonstrate that normal sized buses could pass under the bridge once the vertical alignment had been lowered. We designed a new vertical alignment and created a 3d model using MXRoad and the Openroads tools. We then added an accurate, fully scaled 3d model of a normal sized double decker bus to the model and created an animation of the bus to demonstrate that the bus could easily pass under the bridge on our new vertical alignment. By creating this model it allowed us to show the bus partially underneath the bridge, allowing us to measure the clearance from the top of the bus. To further demonstrate the clearance beneath the top of the bus and the underside of the bridge we attached a camera to the 3d model of the bus and provided a film of the bus passing under the bridge from the perspective of somebody sitting on the top deck of the bridge. The 3d model and the film we created allowed us to gain approval for the scheme with the client having full confidence in our design. We also had to redesign the junction on the approach to the bridge, as the vertical alignment had been lowered, together with the associated footpaths and street furniture. The screenshots below show the partially created model demonstrating that the bus can easily pass under the bridge. The screenshots also show the redesigned junction on the approach to the bridge.